Britain may have been the first nation to introduce postage stamps but since then it seems we have often been rather conservative in our approach, perhaps keen to retain an air of dignity and authority, while other countries have explored approaches to design, introduced novel formats and seem more willing to try something new. In the light of the last few years of Royal Mail issues, and with many collectors protesting that there are simply too many being issued for anyone to keep up, such conservatism may seem like a welcome thing. But the nation’s approach to charity stamps, featuring surcharges to raise funds for worthy causes, seems particularly pedestrian compared to other philatelic bureaux around the world. The understandable need to raise funds during wartime saw Britain and its Empire use the postal system to aid the war effort, but since then we’ve seen very little philanthropy on our post. A 1975 charity stamp for ‘health and handicap charities’ included a surcharge of 1 1/2p with ‘net proceeds… distributed to charities by the Trustees of the Charity Stamps Fund appointed by the National Council of Social Service’, but by all accounts the ‘experimental issue’ was not a rousing success. Collectors of certain countries will no doubt have a variety of examples of postage stamps being used to raise funds in their collections. The Red Cross has long enjoyed receiving funds from the sale of stamps and continues to do so after certain disasters (such as the French issue raising funds for the 2004 Boxing Day Tsunami in the Indian Ocean), giving collectors a poignant theme for a collection. 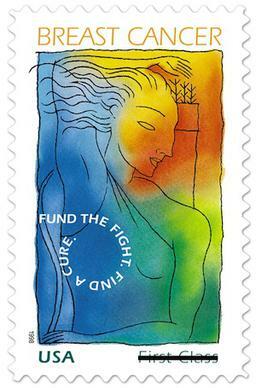 The most recent and resounding example of charity stamps in action, however, must surely be the USA’s breast cancer research stamp (BCRS) which has so far raised well over $87 million. First issued in 1998, the semi-postal stamp has been reissued repeatedly and, in 2015, President Obama signed Public Law No. 114-99 that extended the sale of the stamp through to the end of 2019. Isn’t it time we looked at our fellow philatelic bureaux and followed suit with a new charity stamp? I have spoken to Royal Mail about the idea of a charity stamp and forwarded them a version of this article and a proposal which outlines the idea in more detail. The premise, however, is fairly simple, with a surcharge added there is no added cost for the operators, the goodwill would surely give stamp sales a boost and give Royal Mail some positive PR and, of course, money would be raised for a good cause, my suggestion is Cancer Research UK, but the chosen charity could vary each year and even coincide with Royal Mail’s chosen charities, which benefit hugely from the kind donations and fundraising of the company’s staff. Perhaps there is more red-tape than I imagine, could there be an obvious reason for avoiding such issues in the past that I have missed? Whatever, I thought it worth asking the questions… and months later have had no response. With little feedback from Royal Mail, we have started a petition to see if this approach has more impact. Why not sign the petition and support the idea of a UK charity stamp?